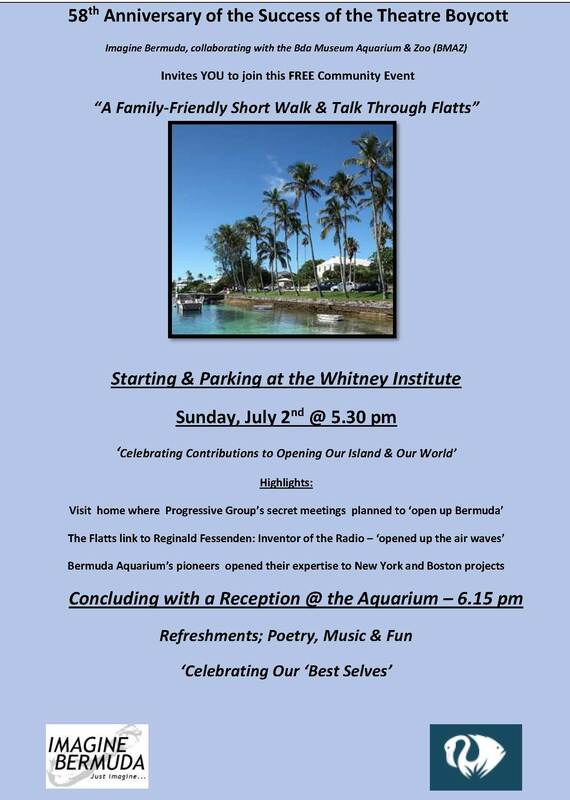 Celebrating the 58th anniversary of the success of the Theatre Boycott, Imagine Bermuda will be hosting a free ‘Family Friendly Short Walk & Talk’ beginning at Whitney Institute on Sunday [July 2] from 5.30 pm in appreciation of the efforts of the Progressive Group. “This quote from Bob Dylan captures a key choice, open to each of us. In reflecting on ‘Life’s Journey’ we can either select a productive mindset, giving birth to our “better selves” or choose otherwise. “For several weeks in 1959, a small group of 20-somethings, who had been ‘busy being born’ personally, spent time together, mindfully reflecting on how they might contribute to giving ‘birth’ to a better Bermuda. “While forging a shared Vision, they came up with the idea of the Theatre Boycott, capturing imaginations across the Island, sparking a community-wide collaboration. Within 2 short weeks of spontaneous, peaceful campaigning, a significantly opened Bermuda was born, on July 2nd 1959. “In appreciation, we are celebrating those efforts on Sunday, July 2nd from 5.30 pm with a free ‘Family-Friendly Short Walk & Talk’. Beginning at Whitney Institute, we will take in the former home of the Williams’ Family, where the Progressive Group secretly nurtured that ‘seed’ of a renaissance. “This ‘Walk’ includes Honourary Co-Patrons; Charles Marshall and Dennis Wainwright – two elders who have demonstrated that productive mindset in both Flatts and Bermuda in general. The ‘Walk’ will also highlight a few other milestones in the Village; such as the link to Reginald Fessenden – the inventor of the Radio and the significance of the Aquarium. 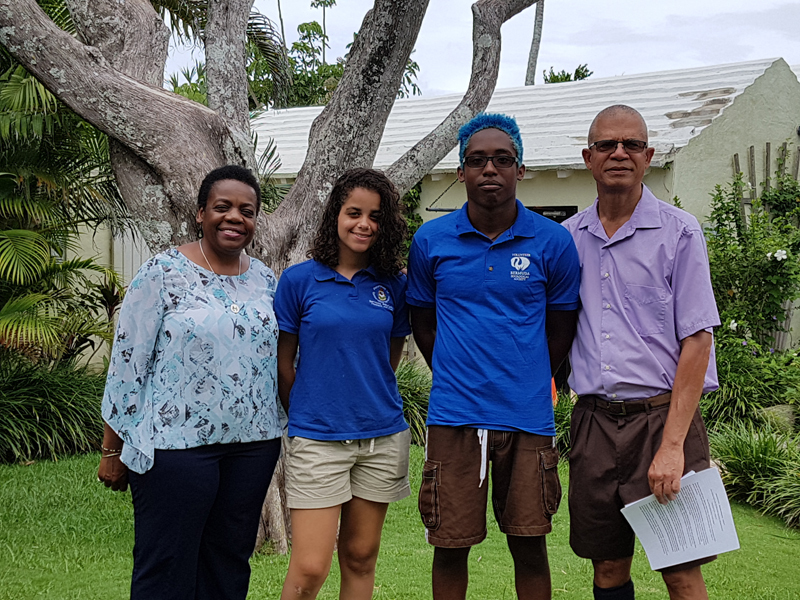 “The Bermuda Aquarium, Museum & Zoo [BAMZ] and the Bermuda Zoological Society [BZS] will host a reception for participants, at their beautifully restored campus, at the conclusion of the ‘Walk’, at around 6.15 pm. This will involve not only light refreshments but also some entertainment; including Gene Steede; young singer/pianist Willard Burch and the Russian School of Dance. “We’ll park and begin at Whitney – a school- and conclude at BAMZ, an iconic part of our local infrastructure promoting ‘life-long learning’. These ‘book ends’ speak to the choice to be ‘busy being born’; the theme captured in reflections of these stories of our Island’s shared heritage, empowering and inspiring upcoming generations. “BAMZ & BZS also demonstrate the power of collaboration, with their small but world-class interactive exhibitions, through rallying volunteer support. That same community spirit that renewed Bermuda in ’59, can today leverage Island sports clubs ‘busy’ developing young people.